This season, I have become accustomed to being by the side of a football pitch at 3pm on a Saturday afternoon. However, this past weekend, for only the third time in 2018/19, I was absent from the terraces. Instead, I was chaperoning my 8-year-old son to his end of season football do at the local Hollywood Bowl. You can probably imagine my deep joy at this turn of events! Anyway, having missed a rare Saturday at the football, I was determined to make up for it by heading to a midweek game. Unfortunately, as I’ve come to discover over the course of my inaugural groundhopping season, most midweek non-league fixtures – especially in and around Sussex – seem to be played on a Tuesday evening. The night I have to ferry my son to football training. Yes, I know I’ve already taken him to his end-of-season do and, yes there are no more matches scheduled, but the last training session was still nevertheless held this Tuesday evening. A quick scan of the fixture lists for both the SCFL and Bostik leagues revealed that there were no matches being played in Sussex on Wednesday night. Typical! Yet no sooner had I prepared myself for having to endure my longest gap between attending football matches since the start of August, did I notice via Twitter that Rusthall were due to be at home Wednesday night in the SCEFL Premier against Canterbury City. Rusthall is located just outside Tunbridge Wells, which is little more than a 50-minute drive from my house. Perfect. Much like Cinderella I would be going to the (foot)ball. (Reading this back, I’ve become painfully aware of the fact that I’ve just compared myself to a Disney Princess. Oh well, I’ll go with it. It is the modern world, after all). My early Wednesday evening drive to Rusthall’s Jockey Farm Stadium took me slightly longer than expected. Not due to unforeseen traffic on the road, you understand, more because my SatNav decided to act like, what can only be described, ‘a complete nause’. Momentarily deciding to turn into my Mum, instead of navigating me the most direct route to my destination, it instead decided to take me the ‘scenic way’. In fairness, some of the blame can be attributed to me here. I know full well how to get to Tunbridge Wells. It’s where my wife and her family are from. But I was on auto pilot, merely following instructions like some mind-controlled sheep, and before I knew it I was in the midst of the Ashdown Forest being taken down a plethora of one-car-wide country lanes! Still, I reached Jockey Farm around 15 minutes before kick-off and found a parking space in the surprisingly busy car park. It turned out a crowd of close to 150 had turned up to watch the game. 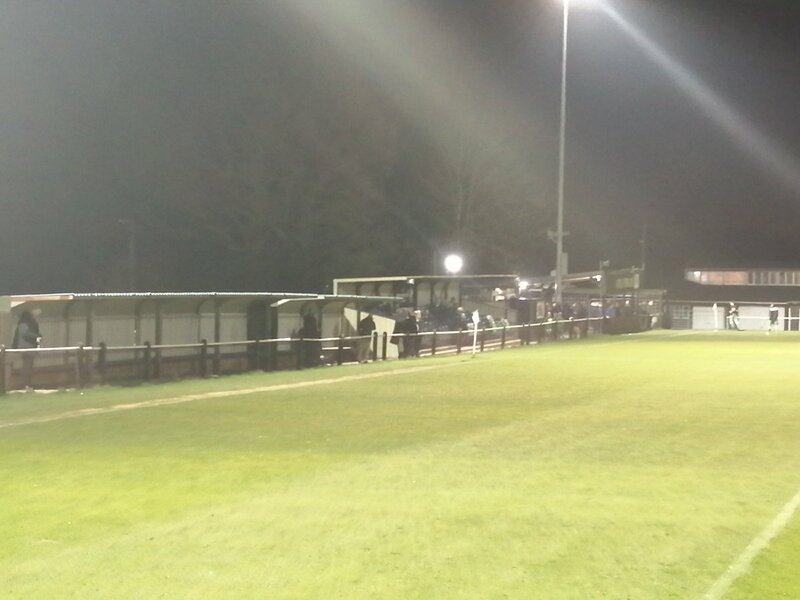 Given the fact it was a Wednesday evening, Rusthall are haunted by the very real threat of relegation and that visiting Canterbury City lead a nomadic existence with no home ground to call their own, I felt this was a pretty healthy turnout. Admission to the ground was £7, but unfortunately there was no printed program (a fact that I was aware of before I reached the stadium). Rusthall have become only the second team I’ve seen this season, after Lewes, to have gone fully digital in their program production. I did have a read of it online before I left home and have to say that it was a really good read – and, of course, free, which is always a bonus. Yet, while I fully understand the financial arguments behind going digital, I still prefer something tangible to hold in my hand and flick through while I’m at the game. 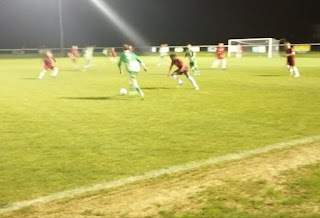 At the same time, I’m also convinced that over the coming seasons the program delivery seen at Rusthall and Lewes will become far more common and eventually the norm – especially at non-league level. I guess it’s something I’m – and others like me are – just going to have to get used to. Jockey Farm is a ground that has come a long way in a relatively short space of time. I was reliably informed by some of the locals I spoke to that it’s a stadium that is rapidly improving all the time. As with many stadiums at this level, the covered areas are all confined to one side of the pitch, and offer a mixture of seating, via what looks to be a fairly new stand, and standing. It’s also got the smallest clubhouse that I’ve seen on my travels so far, although the welcoming was warm, and there is a great selection of food (both and cold) and drink (also both hot and cold) available. I can certainly recommend the burgers! Having previously seen Rusthall play, and beat, TunbridgeWells last month, it was hard to imagine quite why, up until the turn of the year, they had barely picked up any points. They looked a solid and hard-working team on that showing, and in recent weeks have started to grind out results which have given them a decent chance of escaping relegation. With visiting Canterbury City having been knocked out of the FA Vase at the semi-final stage by league rivals Cray Wanderers on Sunday, I was interested to see how they would react. One can only imagine how gutting it must be to have been 90-minutes (I suppose 180 minutes, as Vase semi-finals are played over two legs) away from playing at Wembley in a major final. Would a Wednesday evening visit to lowly Rusthall prove to be a case of After the Lord Mayor’s show for the visitors? Certainly, in the early exchanges, it did appear that City were merely going through the motions somewhat. In a scrappy opening half-an-hour, the visitors had barely posed a threat, while the Rustics had carved out three decent goalscoring opportunities. Canterbury’s keeper, Jack Delo, made good stops to deny the first two chances, while the best of the bunch came courtesy of Sam Murray who outpaced the visitor’s backline, but could then only drag his shot the wrong side of the far post when through on goal. As is so often the case, from Canterbury’s first meaningful attack they then took the lead. The Rusthall defence gave their opponents far too much time and space in the centre of the pitch, and after a good passing move, Adam Woollcott found himself free in the area and finished confidently past Aaron McGuigan. It was a well worked goal, but one I’m sure the Rustics’ faithful will have felt was utterly avoidable. For the remaining 15 minutes of the first half, Canterbury, for the first time in the match, began to assert their control and look like the team placed significantly higher in the league table. 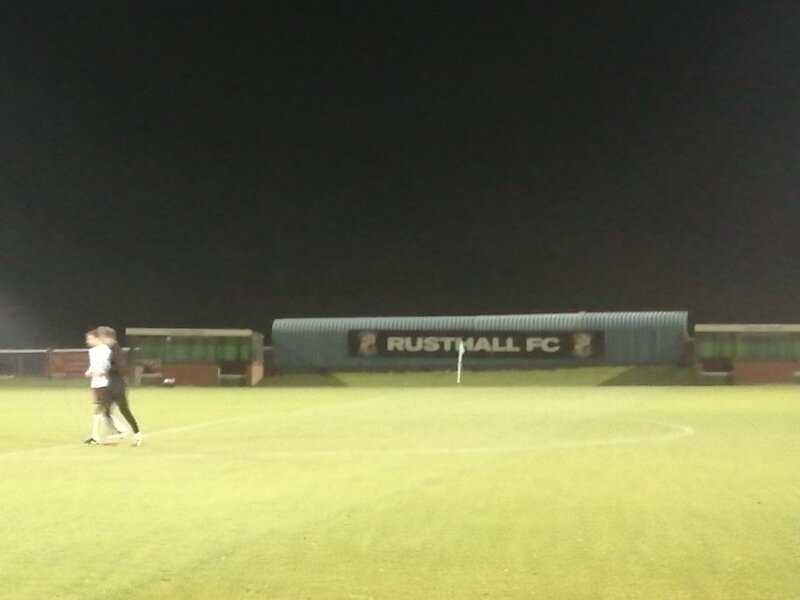 Rusthall looked shaken at going behind, and the fans around me were hoping they would make it to half-time just one behind. However, any thoughts that the half-time break would give Rusthall a chance to regain control of the game were undone within five minutes of the restart. Once more the hosts switched off, and from a throw-in on the halfway line, Canterbury suddenly had all the time and space they needed to work the ball through to Renford Tenyue who never looked like missing once he was through. 2-0. There followed a spell where Canterbury looked like they could run away with the game, as they started to create numerous decent openings. 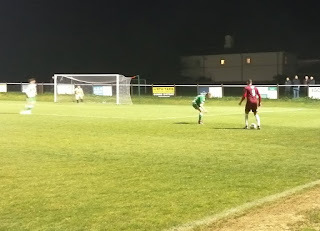 At the other end, Rusthall were still playing some good football in patches, but were all too often let down by a poor final ball in the final-third of the pitch. With around 20 minutes left, though, the hosts once again started to get on top. A succession of chances came and went, especially from corners where, as the videos below show, they probably should have at least worked the goalkeeper. 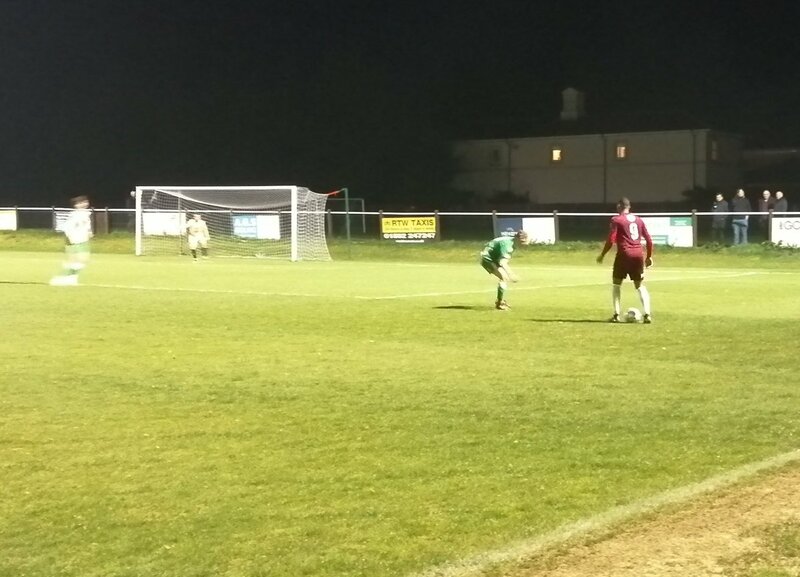 However, even when they did manage to hit the target, Delo was in impenetrable form, most impressively saving Robbie Bissett’s driven free-kick. 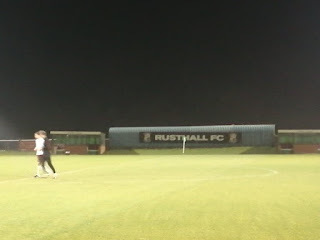 As already mentioned, this is the second time that I’ve seen Rusthall this season, and I have to say I do like Bissett. He’s a calm and composed centre back, and while he does get caught out positionally at times, he’s got the makings of a very good player. 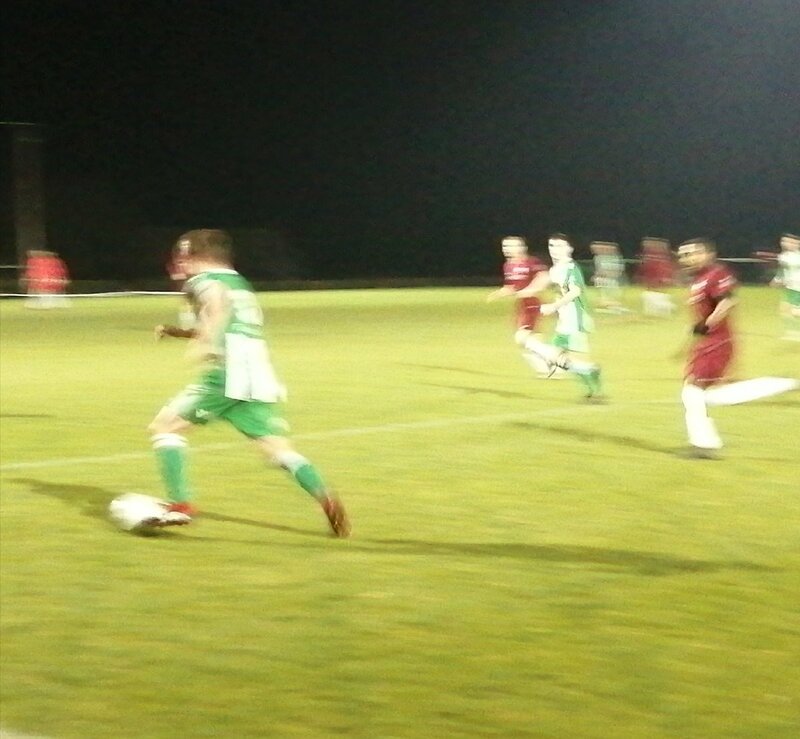 With time running out, and Rusthall throwing men forward in hope of finding a route back into the game, Canterbury had a couple of chances to put the game to bed. Only to be denied by McGuigan. However, a third goal did arrive deep in injury time. 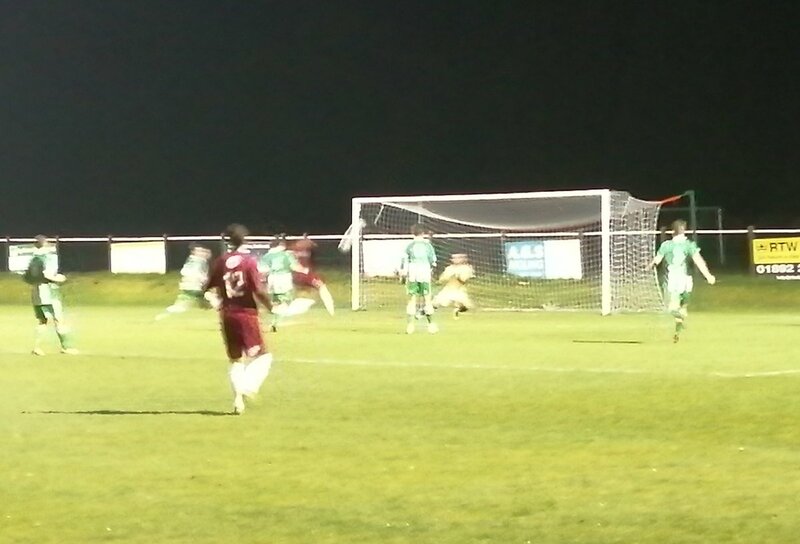 Once again it was a goal that Rusthall will have felt was totally avoidable. A poor throw out from McGuigan (who it has to be said struggled with his distribution at times) was seized upon by the Canterbury midfield, and one pass later the ball arrived at the feet of substitute Joe Nelder, who duly put a flattering (or unflattering depending on your point of view) sheen to the scoreline. No doubt a disappointing result for Rusthall, especially as all three goals almost certainly could have been dealt with better, but full credit to Canterbury for brushing Sunday’s disappointment aside and approaching the game in the right manner. 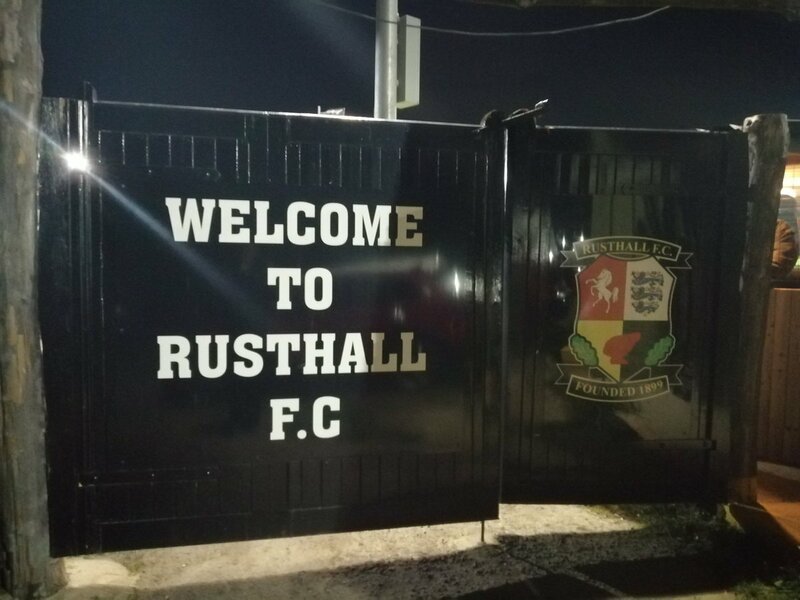 Whether Rusthall will gain enough points to stay up or not is doubtful (although not out of the realms of possibility – especially not on the two displays I’ve seen them give this season). If they do go down, they can perhaps take some small solace from the fact that, having provided half of this season’s FA Vase finalists (neither of which are top of the league at the time of writing), the SCEFL arguably has a claim to be the most competitive division at step 5 on the non-league pyramid.